While in minimum security detention at Natural Bridge Camp, sodomized another male inmate in 1952, with a razor blade held to the other boy's throat. 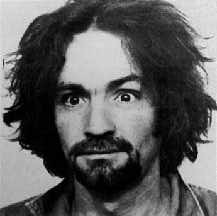 Manson also received three disciplinary infractions for homosexual assault in the same year, forcing his transfer to a stricter reformatory in Chilicothe, Ohio. Manson's file stated that he "definitely has homosexual and assaultive tendencies." See Vincent Bugliosi and Curt Gentry, Helter Skelter: The True Story of the Manson Murders (1974), page 139.